I really like this little guy! I bought him for our first floor which is all hardwood. (I have a bobSweep for the carpeted areas and I actually prefer this smaller one.) He has four brushes instead of one, and he fits under things that the larger one cannot. I have only used it a few times so I don't know how long it will last, but I am happy so far. 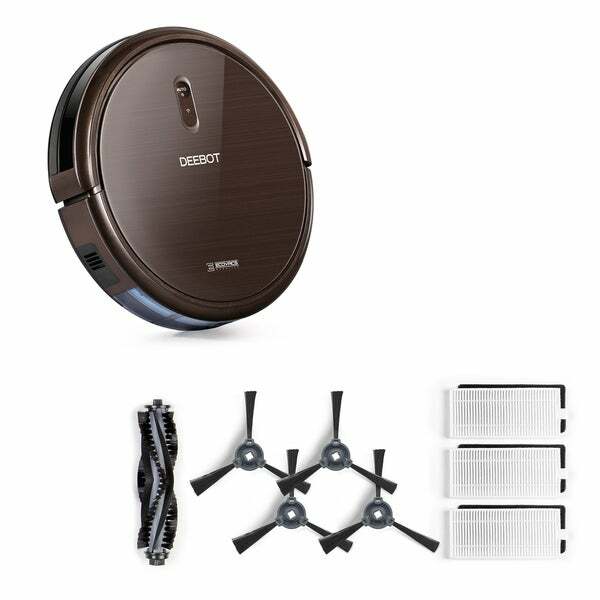 Enjoy easy, convenient cleaning with this robot vacuum. With an array of cleaning modes and brushes, the vacuum cleans carpets and tough spots with ease. The ECOVACS App makes operation easy, with options for remotely scheduling cleaning times, setting cleaning modes, and monitoring cleaning status. Have had this robovac for a year now. Run it 2-3 times a week on mostly laminate floors. Always finds surprising amount of dirt and dust. Battery still lasts long enough for it to clean every room in a 2 bedroom condo. May get stuck once in a while on wires, etc. but beeps right away to let you know. The phone app works well. Would buy this brand again. So, I wanted to give this 4.5 stars but unfortunately that wasn’t an option. I really like this little guy (his name is Jeffrey) and although he isn’t perfect he is pretty darn close for what I was expecting. This robot vacuum is little but very powerful. I clean my floors regularly and run him as well, and I’m always amazed at how much he is capable of picking up despite the fact that my floors already looked pretty clean. The dustbin is very nearly full many of the times I use him even though there’s not much visible dust around. I don’t know how such a small battery powered device has so much suction, but he’s really capable of picking up a lot of stuff. He makes my life so much easier and I love having him around. I’m a cleaning lady so I run him while I clean other peoples houses and I am able to come home to a clean house as well! If I have a criticism it’s that on this basic model there is no option for setting your own cleaning patterns or using virtual walls so he just kind of cleans in a random pattern. While he does pick up a ton of debris, he sometimes misses spots or doesn’t get things in corners. However, I set him loose in a relatively large room. When he’s is in a smaller area he does an even better job. While it doesn’t completely alleviate the need to vacuum, I certainly need to vacuum less, and that’s all that I was expecting. Thus, it definitely meets my expectations. If you are looking for something to completely replace your regular vacuum I would probably look towards a more expensive model that has more bells and whistles. For my needs Jeffrey does a great job. Although I haven’t had him a very long time he has proved to be very sturdy. I can see him lasting a long time as he feels well-made. Overall, very happy with my purchase so far. Works great! No more vaccuming old style I can sit and watch television while the machine operates as it is quiet. Highly recommend works great on wood and carpet.